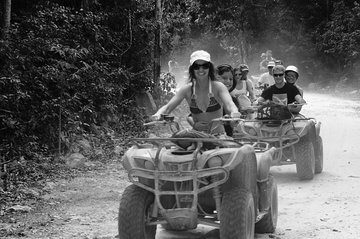 Drive an ATV through the Mexican jungle on a combination off-roading and cenote tour from Playa del Carmen that explores Yucatan nature above and below ground. After 1.5 hours of riding time, you’ll visit a pair of crystal-clear cenotes to swim, snorkel, and zipline, discovering a jumble of underwater stalactites and stalagmites formed over thousands of years. This half-day adventure tour includes a lunch of a Yucatan-style tamal, as well as pickup and drop-off at hotels in Playa del Carmen. At the lobby of your hotel in Playa del Carmen.